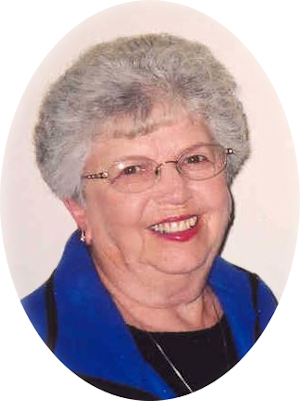 Obituary – Hafner, Dorothy May (Spillman) « Perry High School Alumni Association, Inc.
– belongs to the RRF social club, to Red Hots, and is a member of the Order of Rainbow for Girls. She was born July 25, 1927, in Perry, but attended grade school at Lone Elm and Barrett before enrolling in PHS. Her mother is Mrs. Lillian Spillman of 612 Fir street. After receiving her high school diploma, Dorothy May wants to work here in Perry. Dorothy May Hafner, 76, Orlando, Oklahoma, was the daughter of Ernest and Lillian (Smith) Spillman. She was born July 25, 1927 in Perry, Oklahoma and died Monday, September 1, 2003 at the Perry Memorial Hospital. Dorothy Married Merle Hafner on August 4, 1946 in Perry, Oklahoma. She enjoyed sewing, quilting, square dancing and playing dominoes. She was a member of the Lucien United Methodist Church, the Lucien UMW and volunteered at the Cherokee Strip Museum. Funeral services will be at 2:00 p.m. Thursday, September 4, 2003 at the Lucien United Methodist Church. Rev. C. M. Wilson will officiate. Interment will be at the Zion Cemetery in Orlando. Services are under the direction of Brown-Dugger Funeral Home. Dorothy is survived by her husband, Merle Hafner; one son, Gary Hafner and his wife, Amy, of Norman, Oklahoma; one daughter, Denise Bay and her husband, Ronnie, of Perry, Oklahoma; three granddaughters, Kari Keating, Rachel Hafner and Olivia Hafner, all of Norman, Oklahoma; four step grandchildren; eight step great-grandchildren; one brother, Amos “A. C.” Spillman and his wife, Christine, of Atoka, Oklahoma and two sisters, Donna Brengle and her husband, Kenneth, of Perry, Oklahoma and Dorlene Cook and her husband, Paul, of Ponca City, Oklahoma. She was preceded in death by her parents, Ernest and Lillian Spillman.